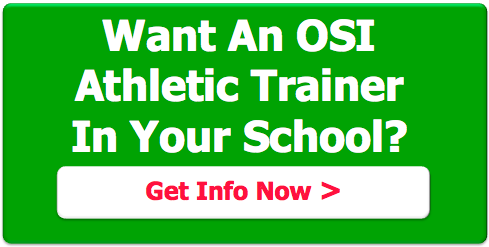 Have you ever heard someone say, “I really want to be an athletic trainer because they make a lot of money!”? Doubtful. Now this isn’t a complaint about the salaries we as athletic trainers have as we know well before deciding to become an athletic trainer what the salary ranges are. Rather, it’s highlighting the passion athletic trainers have for their career and why we do what we do. One of my favorite Pinterst finds was a sign that read, “Education – We’re not in it for the income; We’re in it for the outcome.” I’ve adopted that saying in my athletic training facility replacing education with athletic training. While the income is an important component of why we work, being an athletic trainer goes far beyond the financial reimbursement. So what makes working as an athletic trainer at a high school worth the sometimes 60+ hour weeks, working every Friday night, arriving home late after a football game only to be back the next morning for weekend evals and treatments, taking calls or texts from parents, athletes, or coaches late in the evening or on weekends, working a basketball game until 9:30pm and being back in clinic by 7am the following morning, or the countless hours of documentation, endless calls to parents, updates to physicians, and emails to teachers or counselors? Honestly, it’s the outcome. The excitement in being an athletic trainer isn’t that I get a front row seat at every event I attend (although, it’s sometimes nice to not have to find a seat). What makes me love my job are the relationships I have developed and continue to develop with patients (athletes), parents, coaches, and administration. * It’s progressively returning an athlete from no physical activity to fully returning to a sport following a concussion, seeing their excitement in being able to add activity back to their life each day. * It’s the athlete who gives hugs and a big ‘Thank You’ to his athletic trainer and physical therapist after his last game of the season, which he rehabbed an injury to return for. * It’s watching the young freshman grow and develop into that graduating senior, as they share experiences in athletics and life. * It’s celebrating with an ankle sprain that was on crutches and returning to running activity. * It’s the parent who calls at 7am to inform me that her child sustained a concussion in practice that morning and asking for best management guidelines and to schedule a visit. * It’s the coach from a visiting school who has asked you to teach them a taping technique because it worked really well on their athlete. * It’s the athletes from another school who seek you out to update you on their season and the injury you assisted them with the last time they were at your school. * It’s the ability to reassure parents that an athlete’s physician will have updated information before the athlete’s appointment. * It’s when athletes tell you they’ve created a ‘Steph Call’ (which involves yelling as if they are in excruciating pain) or when they adopt you as a mother figure, calling you ‘Mama Steph’. * It’s having opportunities to teach athletes proper mechanics and form for running, jumping, or throwing; helping relieve pain or irritation and improving efficiency of their movements and sports performance. * It’s when an athlete is excited to talk about their passions, interests, and potential future college major. * It’s getting to know an athlete beyond their injury, providing opportunities to talk about their excitements in life and what they’ve learned. * It’s the thank you from a parent for explaining an injury and rehab process so they better understand the return-to-sport process. I think it’s fair to say with any career that passion shines through. Athletic training is no exception, and it is the excitement of the outcomes we see that continues to drive our passion and keep a smile on our face at the end of a long week.